<h2>How to speed up landmine clearance</h2><br /><p>Bees do it; bugs do it; even African giant pouched rats do it. Along with dogs, they can all detect landmines buried in the soil.</p> <p>Bees can be trained to seek out whiffs of explosives by associating them with sugar; bugs can be genetically engineered to light up in the presence of TNT. And the rats race along a field, scratching the ground whenever they sniff certain chemicals nearby.</p> <p>Yet, despite these headline-grabbing biosensors, and of course drones, robots and other inventions for seeking out hidden explosives, the task of tracking down the millions of landmines scattered in 57 countries around the world is still mostly done by humans wielding metal detectors — few new technologies end up on the frontline.</p> <p>An EU-backed project, TIRAMISU, has spent the last few years trying to change that, bringing together 26 institutions from across Europe and beyond.</p> <p>As part of their work, a group led by Haris Balta, a research engineer with the Royal Military Academy (RMA) in Belgium, used an unmanned aerial system (UAS) which swoops over the land, building up 3D models of the terrain and picking up other data.</p> <p>Their UAS was put through a dramatic test after the floods in Bosnia and Herzegovina in 2014, which displaced thousands of landmines and unexploded ordinance into unknown locations.</p> <p>Balta tells the story of how, armed with the data from these flights, he arrived at a village to discover children playing just 50 metres from where he knew from his data there was a landmine. The children were saved, and the UAS is now respected as a surveying tool.</p> <p>However, new technology can often meet resistance in the field.</p> <p>‘The mine action community is extremely conservative, they are a little scared of changing tools,’ said Dr Yann Yvinec, scientist at Belgium’s RMA and project coordinator of TIRAMISU.</p> <p>‘Since they are risking their life it’s a feeling that can be understood.’</p> <p>Another constraint, according to Balta, is that heavily mined countries often cannot afford high-tech kit and have a plentiful supply of cheap manual labour to do the work.</p> <p>And, finally, many of them are fed up with the queue of inventors wanting to try out their whizzy ideas.</p> <p><strong>1 100 years</strong></p> <p>But, while hand-held metal detectors are trusty and accurate, they are slow. Some campaigners say that, at the current rate, it will take 1 100 years to clear all the landmines.</p> <p>TIRAMISU opted for an incremental, rather than a revolutionary, philosophy — building on the many innovations that already exist. And because they were careful to build connections with the mine action communities, their ideas could be tested in real minefields, in Croatia and Cambodia.</p> <p>Balta’s group, with a partner institution from Germany, Vallon GmbH, has also developed an unmanned ground vehicle, known as RMA tEODor. Low-sized, it moves on caterpillar tracks, carrying an array of multichannel metal detectors.</p> <p><img src="/sites/default/files/landmine%20finder_0.png" alt="Unmanned ground vehicles carrying multichannel metal detectors can check 1 000 square metres an hour. Image courtesy of TIRAMISU" title="Unmanned ground vehicles carrying multichannel metal detectors can check 1 000 square metres an hour. Image courtesy of TIRAMISU" width="600" height="343" class="@aligncenter@" /></p> <p>Each location gets swept by at least two of the detectors, and everything it spots is geotagged so it is precisely located on a map. RMA tEODor can check up to 1 000 square metres in an hour for mines compared with 120 square metres by a hand-held detector.</p> <p>Balta has been able to test his vehicle in Croatia and Belgium, with the Croatian Mine Action Centre.</p> <p>Their first reaction, he recalls was, ‘Oh, another tool that will make our life harder.’ But they suggested a lot of improvements and his group is now teaming up with other industrial partners to develop it for market-readiness.</p> <p><strong>Slow</strong></p> <p>A key reason why mine-detection is so slow, according to the Geneva International Centre for Humanitarian Demining, is that in many cases up to 98 % of an area said to be mined is in fact mine-free.</p> <p>Perhaps due to the extreme caution people take in fencing off mined areas, perhaps due to knowledge gaps, these clear areas nevertheless have to be picked over with metal detectors and waste weeks of clearance time.<br /> <div class="quote-view quotesBlock quote_vertical_right"> <div class="quotesTop"><img src="https://horizon-magazine.eu/sites/all/themes/horizon/images/quotes_top.png" alt="" title="" /></div> <p>‘The mine action community is extremely conservative, they are a little scared of changing tools.’</p> <blockquote><p>Dr Yann Yvinec, Royal Military Academy, Belgium</p></blockquote> <div class="quotesBottom"><img src="https://horizon-magazine.eu/sites/all/themes/horizon/images/quotes_bottom.png" alt="" title="" /></div> </div> </p> <p>Another EU-funded project, called DBOX, aims to narrow the area targeted for clearance with software capable of processing a wide variety of information, including war records, data on mine explosion accidents, the testimonies of local people and the insights of military strategists.</p> <p>Dr Bruno Esmiller, of Airbus Defence and Space, in France, who coordinates the project, explains that the system also incorporates satellite data, and remote sensing data from infrared sensors and LIDAR, as well as data from metal detectors and ground-penetrating radar which helps build up a three-dimensional picture of the earth’s surface using laser pulses.</p> <p>The software can also absorb images from drones that fly at a height of just 30 cm, photographing the terrain and building a three-dimensional picture.</p> <p>‘We centralise all of it in one software tool,’ said Dr Esmiller.</p> <p>One signal that landmine trackers want to pick up is something that metal detectors can't — a signal from the explosive material itself, which leaches in tiny quantities into the soil over time.</p> <p>Marc Beltran, business development director of the Spanish unmanned aerial vehicle company Catuav, is working on detecting it from the safe distance of a cheap, fixed-wing drone that carries sensors that can pick up tell-tale signals in the near infrared part of the spectrum, invisible to the human eye.</p> <p>‘We don’t see anything in this part of the spectrum but there’s a lot of information there,’ he said.</p> <p>The multispectral camera mounted on his AL-Drone also records the land temperature, in the far infrared. Since different substances heat and cool over the day at different rates, objects in the soil such as landmine cases, ought to show up in this data.</p> <p>Combining this information with the explosives signals, and with the high-resolution visual data which the camera also records, Beltran hopes to produce a detection package in a drone that any inexperienced user can operate.</p> <p><iframe src="https://webadmin.cartodb.com/viz/57ebdae8-e482-11e5-9c69-0ef24382571b/embed_map" frameborder="0" width="100%" height="520"></iframe></p> <p><em>Afghanistan tops the list of landmine casualties with 17 704 people killed or injured in a 14-year period. Data source: International Campaign to Ban Landmines</em></p> <br /> <img src=”http://www.google-analytics.com/collect?v=1&tid=UA-40077089-1&cid=how-to-speed-up-landmine-clearance&t=event&ec=republish&ea=read&el=how-to-speed-up-landmine-clearance&cs=republish&cm=republish&cn=republish&cm1=1" /> This post <a href="https://horizon-magazine.eu/article/how-speed-landmine-clearance.html">How to speed up landmine clearance</a> was originally published on <a href="https://horizon-magazine.eu/">Horizon: the EU Research &amp; Innovation magazine | European Commission</a>. A surveying device that spotted a group of children playing just 50 metres from a landmine is part of a new suite of tools that could help improve and speed up the mine-clearing process. Bees do it; bugs do it; even African giant pouched rats do it. Along with dogs, they can all detect landmines buried in the soil. Bees can be trained to seek out whiffs of explosives by associating them with sugar; bugs can be genetically engineered to light up in the presence of TNT. And the rats race along a field, scratching the ground whenever they sniff certain chemicals nearby. Yet, despite these headline-grabbing biosensors, and of course drones, robots and other inventions for seeking out hidden explosives, the task of tracking down the millions of landmines scattered in 57 countries around the world is still mostly done by humans wielding metal detectors — few new technologies end up on the frontline. An EU-backed project, TIRAMISU, has spent the last few years trying to change that, bringing together 26 institutions from across Europe and beyond. 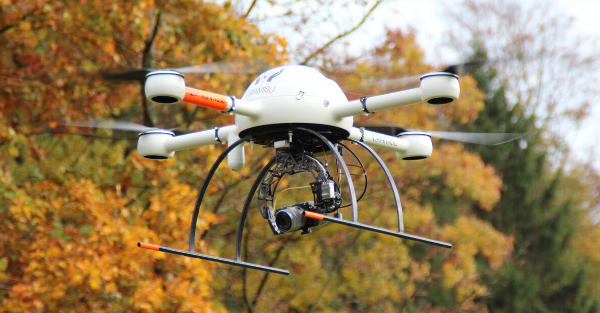 As part of their work, a group led by Haris Balta, a research engineer with the Royal Military Academy (RMA) in Belgium, used an unmanned aerial system (UAS) which swoops over the land, building up 3D models of the terrain and picking up other data. Their UAS was put through a dramatic test after the floods in Bosnia and Herzegovina in 2014, which displaced thousands of landmines and unexploded ordinance into unknown locations. Balta tells the story of how, armed with the data from these flights, he arrived at a village to discover children playing just 50 metres from where he knew from his data there was a landmine. The children were saved, and the UAS is now respected as a surveying tool. However, new technology can often meet resistance in the field. ‘The mine action community is extremely conservative, they are a little scared of changing tools,’ said Dr Yann Yvinec, scientist at Belgium’s RMA and project coordinator of TIRAMISU. Another constraint, according to Balta, is that heavily mined countries often cannot afford high-tech kit and have a plentiful supply of cheap manual labour to do the work. And, finally, many of them are fed up with the queue of inventors wanting to try out their whizzy ideas. But, while hand-held metal detectors are trusty and accurate, they are slow. Some campaigners say that, at the current rate, it will take 1 100 years to clear all the landmines. TIRAMISU opted for an incremental, rather than a revolutionary, philosophy — building on the many innovations that already exist. And because they were careful to build connections with the mine action communities, their ideas could be tested in real minefields, in Croatia and Cambodia. Balta’s group, with a partner institution from Germany, Vallon GmbH, has also developed an unmanned ground vehicle, known as RMA tEODor. Low-sized, it moves on caterpillar tracks, carrying an array of multichannel metal detectors. Each location gets swept by at least two of the detectors, and everything it spots is geotagged so it is precisely located on a map. RMA tEODor can check up to 1 000 square metres in an hour for mines compared with 120 square metres by a hand-held detector. Balta has been able to test his vehicle in Croatia and Belgium, with the Croatian Mine Action Centre. Their first reaction, he recalls was, ‘Oh, another tool that will make our life harder.’ But they suggested a lot of improvements and his group is now teaming up with other industrial partners to develop it for market-readiness. A key reason why mine-detection is so slow, according to the Geneva International Centre for Humanitarian Demining, is that in many cases up to 98 % of an area said to be mined is in fact mine-free. Perhaps due to the extreme caution people take in fencing off mined areas, perhaps due to knowledge gaps, these clear areas nevertheless have to be picked over with metal detectors and waste weeks of clearance time. Another EU-funded project, called DBOX, aims to narrow the area targeted for clearance with software capable of processing a wide variety of information, including war records, data on mine explosion accidents, the testimonies of local people and the insights of military strategists. Dr Bruno Esmiller, of Airbus Defence and Space, in France, who coordinates the project, explains that the system also incorporates satellite data, and remote sensing data from infrared sensors and LIDAR, as well as data from metal detectors and ground-penetrating radar which helps build up a three-dimensional picture of the earth’s surface using laser pulses. The software can also absorb images from drones that fly at a height of just 30 cm, photographing the terrain and building a three-dimensional picture. ‘We centralise all of it in one software tool,’ said Dr Esmiller. One signal that landmine trackers want to pick up is something that metal detectors can't — a signal from the explosive material itself, which leaches in tiny quantities into the soil over time. Marc Beltran, business development director of the Spanish unmanned aerial vehicle company Catuav, is working on detecting it from the safe distance of a cheap, fixed-wing drone that carries sensors that can pick up tell-tale signals in the near infrared part of the spectrum, invisible to the human eye. ‘We don’t see anything in this part of the spectrum but there’s a lot of information there,’ he said. The multispectral camera mounted on his AL-Drone also records the land temperature, in the far infrared. Since different substances heat and cool over the day at different rates, objects in the soil such as landmine cases, ought to show up in this data. Combining this information with the explosives signals, and with the high-resolution visual data which the camera also records, Beltran hopes to produce a detection package in a drone that any inexperienced user can operate. We’re fighting a different kind of wildfire whose behaviour experts are struggling to predict.